Image caption Rudy Giuliani said if Mr Trump pardoned himself it would be "politically tough"
Donald Trump probably has the power to pardon himself in the Russia collusion affair but does not intend to do so, his lawyer Rudy Giuliani says. A special counsel is investigating Russia's role in the 2016 election, and whether Mr Trump obstructed justice. The question of self-pardon arose after the New York Times published a letter to the counsel from Mr Trump's lawyers. In it they say he has absolute power as US legal chief to end investigations, or "even exercise his power to pardon". Such absolute powers, they argue, mean that he could not have obstructed justice in any case. Could the US president pardon himself? How easy is it for Donald Trump to be impeached? What has Mr Giuliani said? He appeared on ABC's This Week programme and was asked whether Mr Trump had the power to pardon himself. Mr Giuliani, the head of Mr Trump's legal team, said he "probably does", but added: "He has no intention of pardoning himself." Speaking on CNN on Sunday, House Republican Majority Leader Kevin McCarthy said that no president should pardon himself. Why would Mr Trump need to pardon himself? It all stems from the investigation by special counsel Robert Mueller into alleged collusion between the Trump team and Russian officials in the election campaign that brought the president to power. Mr Trump has always maintained there was no collusion and that the investigation is a "witch hunt". Part of Mr Mueller's investigation is looking at whether Mr Trump sought to criminally obstruct it, in particular with the sacking of ex-National Security Adviser Michael Flynn and former FBI director James Comey, and with his reaction to Attorney General Jeff Sessions' recusal from the investigation. So could he do it? No-one really knows. There is no precedent for a president trying. In the case of former President Richard Nixon, the Justice Department said he could not pardon himself, but others argue it is not precluded in the US Constitution. This latter theory was something touched on in the newly leaked letter. So what is this letter all about? It is dated 29 January and was sent to Mr Mueller by John Dowd, one of Mr Trump's lawyers who has since left the team. The New York Times obtained the letter and published it in full. Citing the powers given to him by the Constitution, it says the president can "terminate the inquiry, or even exercise his power to pardon". Mr Giuliani said himself last week that the special counsel's investigation may be "entirely illegitimate". But that was dated a while back and the probe is still going? It is indeed. Robert Mueller is not going away. He has requested an interview with the president over obstruction of justice. Mr Trump has previously said he might be willing to attend but his lawyers appear opposed, fearing it could lead to charges of perjury. 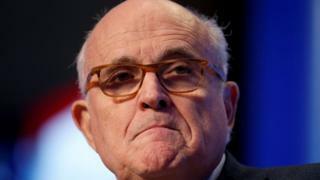 Mr Giuliani told ABC: "It's beginning to get resolved in favour of not doing it." If the president does not attend, Mr Mueller could try a grand jury subpoena but, as the letter above shows, the Trump team would try to block it. The whole thing could end in a court battle over what can and what cannot be applied to a president. In any case, any attempt to impeach the president over the Russia affair would not be affected. That's a political process and pardons would not prevent it. Where are we with the Russia-Trump inquiry? Mr Mueller has indicted 19 people as part of his investigation so far, including four members of the Trump campaign team or administration. Thirteen Russians have also been charged over their links to the Internet Research Agency (IRA), a Russian "troll factory" accused of spreading fake news stories through US social media. In April, Dutch lawyer Alex van der Zwaan became the first person to be jailed as part of the FBI investigation. He was sentenced to 30 days in prison and fined $20,000 under a plea deal, after being convicted of lying to investigators about his contacts with ex-campaign aide Rick Gates, who was one of the people charged. According to an analysis of public records by CNN, at least 12 Trump associates had contacts with Russians during the campaign or transition, including the president's son-in-law and adviser, Jared Kushner, and his son Donald Trump Jr.
Mr Trump's supporters maintain that contacts with foreign nationals are a normal part of a presidential race, but two Trump aides have previously admitted to lying about the encounters. Trump: How could he be impeached?